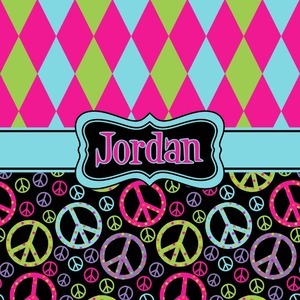 The Harlequin and Peace Signs Design is sure a nice throw back to the 70s. The retro design features harlequin print on the top half in hot pink, lime and light teal. The bottom half is colorful peace signs in the same color scheme on a black background. The larger peace signs have fun polka dots and are surrounded by smaller solid colored peace signs. This fun retro design features the classic ribbon in teal, with a decorative rectangle label / frame in teal and black. The personalization is in a retro font in pink with a teal outline.